Marinating the ribs overnight leaves the meat deeply infused with the flavors of wine and spice, and the red wine helps the beef brown beautifully, giving the whole dish a deeper color. Make a sachet by wrapping the garlic, thyme, orange zest, bay leaves, allspice, peppercorns, and cloves in a 6-inch square of cheesecloth, pouch style. Tie the sachet closed with cooking twine. Pour the wine into a medium saucepan, add the sachet, and bring to a boil over high heat. Reduce the heat and simmer gently for 10 min. Set the marinade aside to cool. Meanwhile, trim away any excess fat from the top of each rib down to the first layer of meat, but don’t remove the silverskin or tough-looking tissue that holds the ribs together or onto the bone. Put the ribs in a container wide enough to fit them in a snug single layer (a 9×13-inch dish works well), season with 1-1/2 tsp. salt, and pour over the cooled marinade and sachet. 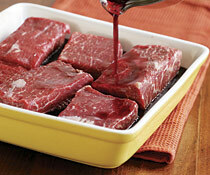 Cover with plastic wrap and refrigerate for 12 to 24 hours, turning the ribs once or twice. Position a rack in the lower third of the oven and heat the oven to 300°F. Remove the ribs from the marinade, reserving the marinade and the sachet. Pat the ribs dry thoroughly with paper towels. Heat 2 Tbs. of the oil in a 5- to 6-quart Dutch oven (or other heavy pot with a lid) over medium heat until hot. Add only as many ribs as will fit without touching, and brown them, turning with tongs, until nicely browned on all sides, 3 to 4 min. per side. Transfer to a platter, and continue until all the ribs are browned. Pour off and discard most of the fat from the pot. Add the remaining Tbs. of oil and return the pot to medium heat. Add the onion, celery, and carrot, season with slat and pepper, and cook, stirring occasionally, until browned in spots, about 8 min. Stir in the tomato paste, and cook for 2 minutes, stirring. Add half of the reserved wine marinade, increase the heat to high, stir to scrape up any browned bits, and bring to a boil. Continue to boil until the liquid is reduced by half, 2 to 4 minutes. Add the remaining marinade and reduce again by about half, another 3 to 5 min. Add the broth and vinegar and boil for 3 min. Return the ribs to the pot, preferably in a single layer, along with any accumulated juices and the sachet. Crumple a large sheet of parchment and smooth it out again. Arrange it over the pot, pressing it down so it nearly touches the ribs, allowing any overhang to extend up and over the edges of the pot. Set the lid in place, and transfer to the oven. Braise, turning the ribs with tongs every 45 minutes, until the meat is fork-tender and pulling away from the bone, about 2-1/2 hours. Use tongs or a slotted spoon to carefully transfer the ribs to a serving dish. Don’t worry if some bones slip out. Cover loosely with foil to keep warm. Strain the braising liquid through a fine mesh sieve into a 4-cup measuring cup, pressing gently on the solids and sachet to extract the liquid. When the fat has risen to the top, tilt the measuring cup so that you can spoon off and discard as much of the fat as possible. You should have about 1 cup of sauce that’s the consistency of a vinaigrette (only slightly thick). If the sauce seems thin and the flavor weak, transfer to a saucepan and simmer over medium-high heat until reduced to an intensity and consistency you like. Taste and season with salt and pepper. If the sauce needs more punch, add a splash of vinegar. Spoon the sauce over the ribs and serve. These are sinfully good. I'm in the middle of making them for the umpteenth time and the table reviews are always the top from a very tough crowd. Only change I've made is 2T of sugar that picks up the 'stickiness' of the sauce. I marinated for four hours, I probably wouldn't do anything less. 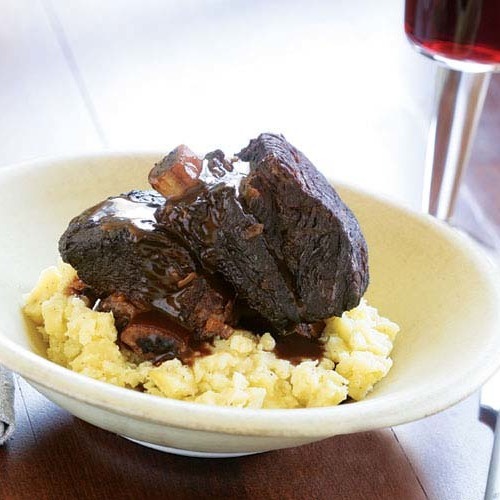 Very tender and flavorful, my guests were very impressed! I have made these 3 times, have always marinated the ribs for 12 - 24 hours, browned them really well, and the last time I made them, I refrigerated them 24 hrs before serving them. This allowed me to skim off the thick layer of fat. These are unbelievably flavorful and tender! 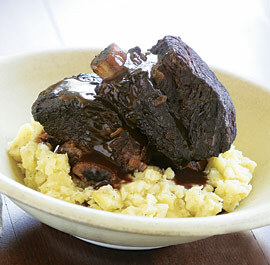 The cooked down braising liquid is dark, satiny and sinfully good!! Add some red wine vinegar just before serving to give it that kick. I served these the last time with potato/parsnip pure, and the sauce poured over everything was beautiful...and delicious.